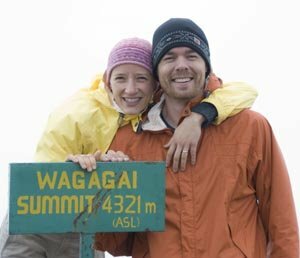 So many hikes! So few breaths! 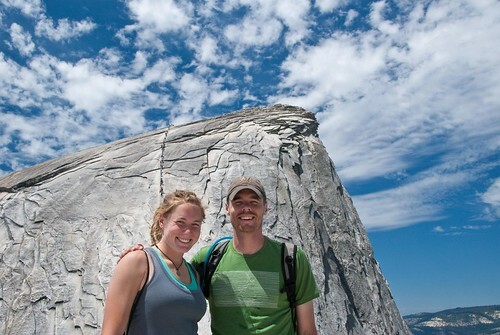 Here is a picture of Nate and Georgia in front of Half Dome - if you look closely you can see the line of people pulling themselves up with cables attached to the rock. Scary! Yosemite-5577, originally uploaded by Nate Bosscher. Click on either of these pictures to be taken directly to the rest of our pictures on Flickr.com. Once you're there you can click on "San Francisco (set)" or "Yosemite (set)" to watch the collections in a slide show. A few weeks ago, Nate and I went on a quick trip to California to visit Georgia, Nate's sister, and to check out San Francisco - one of those cities we just figured we'd love. It was a wonderful long weekend. Two nights in our tent in Yosemite National Park helped us to really, really appreciate subsequent nights in a hotel in San Francisco. As you can see by the picture, it was fairly cloudy and cold in SF, but the weather in Yosemite was drastically different (normal for the region) - with temps reaching 94 on our hike up Half Dome. About Half Dome - HOLY COW - it was hard. 15 miles round trip took us about 8 1/2 hours. I still am hoping that I find out I am anemic or something, cause its seriously sad how difficult it was for me. Altitude at the top was less than 9,000 feet, but there were some very steep climbs. Maybe I'll just use the excuse that I was hiking with the best college Ultimate Frisbee woman in the United States....so surely she is in way too good of shape for me to expect to keep up with her....? Anyway, of course while drinking a cold Anchor Steam with our feet in the cool river, we were thrilled we embarked on the journey. In San Francisco we put in quite a few miles as well. Have you ever started off for your destination thinking you'll get on a bus as soon as one comes but then one never comes so you keep walking and walking and walking? 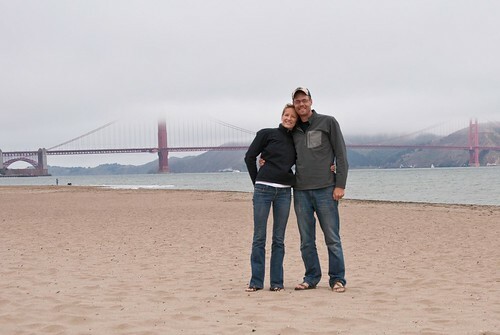 That's what we did from our hotel near Fisherman's Wharf to the Golden Gate Bridge. The bridge is pretty sweet - especially the short hike through the park to the beginning of the bridge. Thankfully we found a bus to make the return trip. We didn't ride a trolley car, but we did have some excellent food. We were really excited about our meals at The Slanted Door (Vietnamese) and Greens Restaurant (vegetarian) - both highly recommended by friends and our guide book. I told Nate that my only complaint about San Francisco is that you feel a lot of pressure to be hip and dress really cool. Otherwise, with a very high paying job, I would totally live there. San_Francisco-5723, originally uploaded by Nate Bosscher.